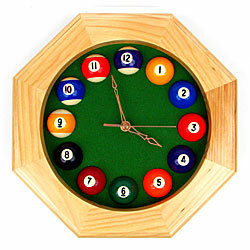 A great way to bring pool into your every day life is with our billiard clocks. We have clocks made with real pool balls, neon lights, and more. These will add a nice touch to any pool room! Get one of our nice billards clocks and any time will be pool time! This clock measures 11.75 in diameter. Octagonal in shape, it features real (but smaller scale) pool balls for the numbers. It is well constructed from solid oak with Dark Green Mali Felt. This clock has a quartz movement to ensure accurate timekeeping which requires 1 AA battery (not included).